Hey, we’ve got some WBC beef! Maybe this tournament is legit after all. After Wednesday’s 8-0 USA win in the final, some American players took issue with what saw they as Puerto Rico’s assumption that the title was theirs to take. 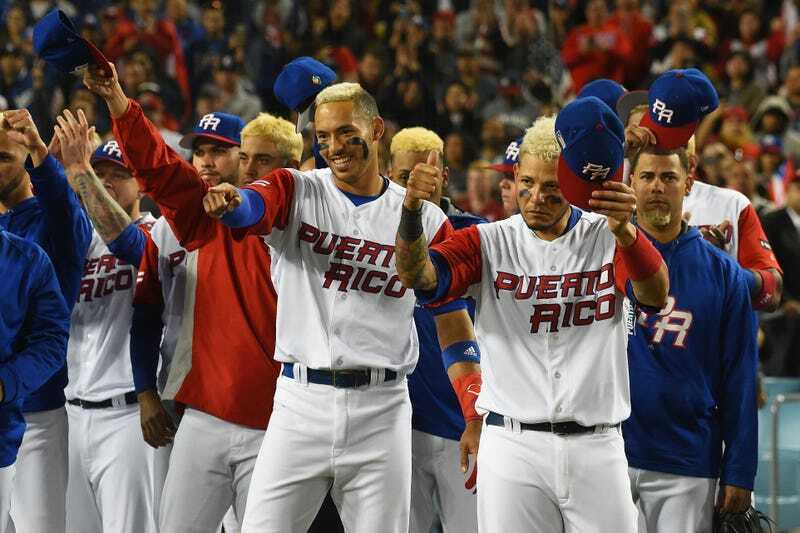 The Puerto Ricans displayed their WBC champion gear (hats and t-shirts were made up for both teams, but only the Puerto Rican players showed off their before the game), and talked about their plans for a flight back to PR and a parade to celebrate. Puerto Rico’s players heard those comments, and they were not happy. Yadier Molina, at the parade held in San Juan on Thursday, fired back at Jones and demanded an apology. “Adam Jones...is talking about things he doesn’t know about,” Molina told ESPN. “He really has to get informed because he shouldn’t have said those comments, let alone in public and mocking the way [preparations] were made. Carlos Correa noted that a parade was in the works even during pool play, and was going to happen if PR made the final, win or lose. Correa then offered up a fairly sick burn when he compared how much the WBC meant to each team. And then Molina might have scored the best dig of all, noting that he was at a party while all the American WBC players were back at work. I also don’t think there’s any real bad blood here. The Americans used the Puerto Ricans’ party planning as a motivator, because pro athletes will use whatever’s around. The photo atop this post is the Puerto Rican team saluting the Americans after the final out, so there was certainly no animosity on the field. This is good old-fashioned trash talk, and maybe it’s the start of something American baseball has never had: an international rivalry. That would be good for the game and good for the next edition of the WBC in 2021.